"Sorry! This site requires Internet Explorer 5.5 or higher!" When a web browser connects to a web site it passes in a "signature", referred to as the User Agent string. It normally contains information like the operating system your computer is using and the web browser type and version. Web servers and HTML pages can use that signature to conditionally present web pages to you based on the capabilities of your browser. If a web site developer has limited resources they may only ensure that their site works with the most popular browser on the web, which is Internet Explorer. If it is an older site that has not been updated in a long time they may have assumed that only IE can render the site properly and, not wanting to have to deal with other browsers, simply prevented them from coming in. 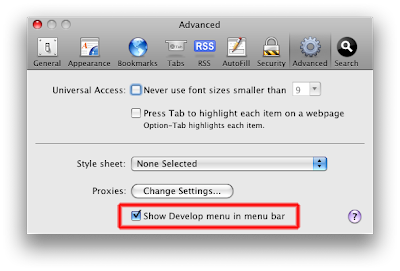 Select the option at the bottom to show the Develop menu and you will see a new top level menu option named Develop right next to the Bookmarks menu. From here you have access to a couple of cool things, though what we need is the User Agent selection. Just select Develop / User Agent from the menu and select a browser signature that matches up with what the web site indicates the browser is limited to. Reload the site and chances are you will be able to get in. Beware! Using this technique is not wise for anything really critical – there is a possibility that data entry forms may not work properly or that controls on the forms may actually give incorrect data. There is even the possibility that the browser will have some serious problems on the site. I would only use this technique if you really want to see something that a site is telling you they don’t want you to see and you don’t have access to a browser that works. 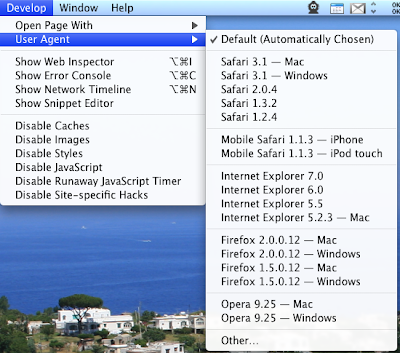 This option does not make Safari emulate IE or any other browser. It simply tells the web server you visit that it is something other than Safari. You will also want to reset this to Default after you are done because many sites perform conditional rendering based on the type of browser you have. Those warnings aside, if you’ve ever felt a little left out because someone decides that you should not be able to see a site because you are running a Macintosh, at least this way you can get in and see what all the fuss is about.